When you talk of Cornwall’s history you will inevitably end up discussing pirate invasion, the mysterious lives of the, ‘little people’, mining accidents and their legacies and of course knockers, spriggins and piskies will crop up too. The county is packed even tighter than your overburdened suitcase with myths, legends and UFO sightings and there isn’t a town or village this side of the Tamar that doesn’t have it’s own tale to tell especially at Halloween. Would you believe me if I told you we don’t need to cast our imaginations back to the days of smuggling to find a tale that will shiver more than your timbers? As recently as 2009 a dark thick furred creature with a bushy tail, glowing eyes and standing around 3/4ft tall was spotted along the coastal walk from Swanpool to Gyllngvase. 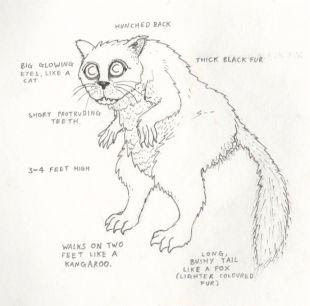 Another sighting of, ‘a strange cat-like animal in a tree in the swampy area round the back of Swanpool in 2006’, was reported through the Falmouth Packet and described as, ‘…curled in a cat’s cradle position and looked a bit like an enormous Kuala bear with a long bushy tail. It had long black hair with a brownish tinge.’ Still today at this time of year the story entices people to make the dark and daring walk around the Swanpool lake and along the coastal path to Gyllngvase, without running. A Sketch Made by Mr Bradbury in 2006 of the, ‘Falmouth Beast’. What do you think scarey? Or on the verge of cute? With one of the worlds largest natural harbours it makes sense that a beast not too disimilar to that of Scotlands fresh water, ‘Loch Ness Monster’, would choose to take up residence in the depths of our bay. During the nineteenth century fisherman reported netting sea serpents with legs and horned heads up to 20ft long off the Cornish coast. Moving on to the first few years of the 1970’s and several sightings of a, ‘Morgawr’, (Cornish for, ‘Sea Giant’), began to emerge. Described as being 20+ft long with a humped back, long neck and horned head. The creature has been sighted in the Helford River, off Pendennis Point, along Rosemullion head and Trefusis point in fact, this stretch of coastal path is know locally as, ‘Morgawr Mile’. 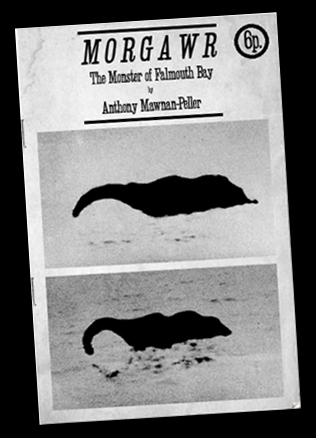 A wonderful pamphlet produced in 1976 to introduce visitors to, ‘The Monstor of Falmouth Bay’. For several years sightings or at least reports of seeing, ‘Morgawr’, stopped until the late 90’s when several more sightings along the Swanpool to Gyllngvase coastal path were made and another one as close as just off the shore at Gyllngvase beach. So tonight if you want to test your nerve, send a little shiver up your spine or simply explore the mysteries of the Falmouth coast it looks like a stroll between Gyllngvase to Swanpool and perhaps once or twice around the lake at dusk could be on the agenda. Have you got a spooky Falmouth tale to tell?